NOTICES FILINGS TODAY FOR SEPT CONTRACT MONTH: 0 NOTICE(S) FOR 0 OZ. This post was published at Harvey Organ Blog on September 11, 2017. Fed Chair Janet Yellen had a breakfast meeting with Donald Trump’s daughter, Ivanka, on Monday, July 17 from 8am to 9am, at the U. S. central bank, according to Fed public schedules, posted earlier this month on the Fed website. Bloomberg first reported the encounter. Eight days after the one-hour meeting in a private dining room at the Fed, on July 25 Trump told the Wall Street Journal that Yellen was ‘in the running, absolutely,’ for a second term as chair. ‘I like her; I like her demeanor. I think she’s done a good job,’ he said. ‘I’d like to see rates stay low. She’s historically been a low-interest-rate person” the president added about the Fed chairman. Alas, if prices are any indicator of demand, which they’re pretty much universally accepted to be unless you’re discussing minimum wages with Bernie Sanders, then Hillary may want to double down on efforts to rush out the sequel as both Amazon and Walmart have decided to slash prices of “What Happened” by 40% before the books even hit shelves. Mike Gleason: It is my privilege now to welcome back David Smith, senior analyst at The Morgan Report and regular contributor to MoneyMetals.com. David, thanks for joining us again and how are you? David Smith: I’m just fine, Mike. It’s great to be back. Mike Gleason: Well, David, not too long ago you wrote an article for our site about how gold and silver were getting ready for an historic run you called it. So, before we start discussing some of the market action here recently, fill our listeners in on why you believe things were set up and are set up for us to see a good run in the metals here. David Smith: Well, we’ve had a very trying period since 2011 when a lot of people have been really worn out and torn out and left the market because the prices have declined substantially and what is really a normal reaction in a very large bull market, what we call a cyclical reaction within a secular bull market. The prices, if you look at other times in history where this has happened, the prices did not decline more than what you would expect but it’s pretty hard when you see prices drop by 40 or 50% over five years. Last year kind of started to turn things around and then we had a correction from that. And now we’re building this very large sideways space, which all sorts of indicators are indicating that we’re now ready to launch into the next part of the bull market, which will be as David Morgan has always taught it will be the most profitable part of the whole thing and we’re looking at probably three to five years of advancing prices and maybe more in gold and silver as this thing gets under way. So we’re building this base. It’s moved about $1,300, gold as you know last week and held there. So things are going to be going a very positive way for the bulls going forward here. Mike Gleason: So the metals have been showing some good signs of life here. We’ve got gold at its high for the year. Silver is still lagging a bit and hasn’t reached its high for the year yet. Now, I’m not sure if you’re thinking the same thing, but things are feeling a little bit different this time in terms of the advance that we’re seeing and the set up that you just alluded to. Do you think silver will finally start outperforming? And how much of a run do you see in silver prices in the next say six to 12 months? 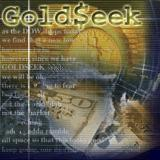 This post was published at GoldSeek on 11 September 2017. The US Federal Reserve, the European Central Bank (ECB) and Bank of Japan (BOJ) have all been hyper-active in recent decades. But the low-rate policies have not produced the same outcomes. The US, after home prices declined in 2008 and 2009, took a while to recover. Only in 2012 did US home prices begin to rise again. This post was published at Wall Street Examiner on September 11, 2017. Is the Gold Price Going Up from Last Week’s One-Year High? Not only did the gold price manage to stay above the $1,300 resistance level last week, but the metal surely and steadily climbed even higher. From Friday, Sept. 1, to Friday, Sept. 8, the price of gold gained 1.6% to $1,351. Gold was clearly buoyed by the U. S. dollar’s plunge to a nearly three-year low. The U. S. Dollar Index (DXY) – which measures the greenback against other currencies like the yen and the euro – dropped from 92.81 to 91.33 last week. That was the lowest since December 2014. But North Korea’s testing of a hydrogen bomb – considered the country’s most powerful to date – on Sunday, Sept. 3, sent gold prices higher. On Tuesday, Sept. 5, the price of gold jumped 1.1% to $1,345. Despite falling since then to $1,339 today (Monday, Sept. 11), gold is now up 16.2% in 2017, easily beating the S&P 500’s 10.9% gain since then. Some indicators are starting to place the metal in overbought territory. While this could lead to a brief dip, I remain bullish on gold in the medium and longer terms. Today, I’m going to share with you my bullish gold price target for the end of 2017. This one is going to hurt. Stanley Fischer is one, if not, our favorite economist. Our friend, Terence Reilly, over at the Wall Street Blog sums it up best. When the pressure is on we like to have what we term ‘adults’ in the room. The ‘adults’ are not only the smartest people in the room but they are people who know how and when to make a decision. Stanley Fischer is one of those ‘adults’. Dr Fischer, former professor at MIT, vice chairman of CitiGroup, and chief economist of the World Bank, and former Governor of the Bank of Israel, resigned his position as vice chair of the Federal Reserve. Fischer played the role of intelligent hawk who we felt comfortable leaving in charge of the store. As this critical time approaches of the Fed removing stimulus his absence alone makes us less confident in the ‘adults’ left in the room. In one of his last public speeches as part of the Federal Reserve Dr Fischer warned about historically high asset valuations. Many more people need to understand what that word really means, and how it applies to pretty much everything in the current human living arrangement. Especially the so-called ‘developed’ nations. Let’s take these three definitions one at a time. Said another way, the daily comforting stories we are told about how all of this somehow makes sense are just a load of nonsense. Each is entirely unsupportable by the evidence, facts and data. What happens when a culture’s dominant narratives are not just unsatisfactory, but entirely unworkable? Well, for one thing, the younger generations that are being asked (goaded?) to step into an increasingly flawed future begin to resist. Which is completely understandable. They have nothing to gain if the status quo continues. This post was published at PeakProsperity on September 8, 2017. Last week we heard optimistic noises coming from some of the top executives in the world of mortgage finance at the Americatalyst 2017 event. Falling interest rates have managed to get new applications for mortgage refinancing even with purchase loans for the first time in months, this as the 30-year mortgage has fallen back to pre-election levels. We’re still calling for the 10-year Treasury to go to 2% yield or lower. The good news for Q3 ’17 earnings is that production volumes and spreads are improving for many lenders after a dreadful start of the year. Bad news is that falling yields on the 10-year Treasury implies a significant mark-down for mortgage servicing rights (MSRs). The movement of benchmark interest rates, coupled with significantly lower lending volumes and surging prices for collateral, could make Q3 ’17 a very interesting – and treacherous – earnings period for financials with exposure to MSRs and other aspects of residential housing finance. Away from the blissful consideration of the housing sector, tongues were set wagging late last week when Liz Hoffman at The Wall Street Journal reported that Goldman Sachs (NYSE:GS) commodities head Greg Agran will leave the firm. ‘Mr. Agran’s departure follows the worst slump in Goldman’s commodities unit since the firm went public in 1999. Bad bets on the prices of natural gas and oil contributed to a second quarter in which the unit barely made money,’ The Wall Street Journal reported. Whether due to the broader risk-on move, or as a result of a surge in inflation fears in the aftermath of Hurricanes Irmas and Harvey, today’s auction of $24 billion in 3Y paper was arguably the ugliest yet in 2017. The Irony for the Money-Printing Central-Bank Hedge Fund? 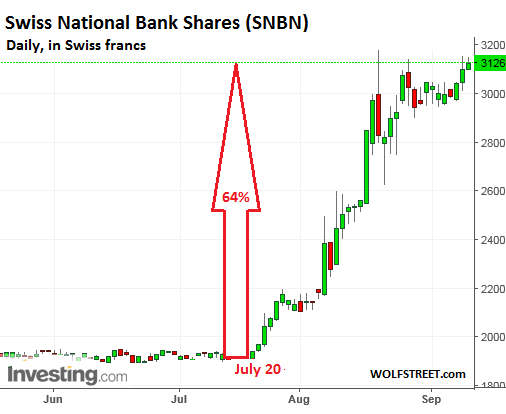 So Swiss National Bank shares soar 64% in 2 months. The central bank of Switzerland has become a huge hedge fund since it decided in January 2015 to print Swiss francs – for which there is huge global demand – and sell these freshly created francs to buy bonds and stocks that are denominated in euros and dollars. US stocks are a particular favorite. The Swiss National Bank (SNB) has thereby created a fantastical money-fabrication scheme. This scheme is publicly traded. And the shares have become a doozie. This post was published at Wolf Street on Sep 11, 2017. Last week, when the eye of Hurricane Irma was still expected to pass over Miami, resulting in potentially unprecedented damages, including dramatic losses to the P&C sector, we reported that “Catastrophe Bond Investors Face Wipe Out As Hurricane Irma Approaches.” This was partially validated by several liquidation trades, the most prominent of which was the plunge in the Citrus Re Cat bonds, which were repriced from par to 50 cents on the dollar after someone dumped a massive chunk of the paper heading into this weekend, unwilling to hold on further risk exposure which according to some of the more aggressive loss estimates, saw as much as the entire principal on the issue wiped out. As it turns out, it wasn’t just that one Citrus Re seller who got spooked: following the latest weekly remarking of the Swiss Re Cat Bond price return Index, the entire catastrophe bond sector saw broad-based, pardon the pun, liquidations last week and as a result was marked down by a record 16% on Friday, wiping out all of the year’s gains and then some. Eventually physical demand for precious metals will swamp the games being played in the paper (i.e., futures contract) markets. So every time the commitment of traders report (COT), which tracks those paper games, turns bearish while gold and silver continue to rise, the precious metals community watches hopefully for signs that fundamentals are at long last about to ignite a massive bull run. The past couple of months followed this script (see Lightening-Fast COT Reversal: Now Fairly Bearish For Gold And Silver) as gold and silver kept rising for a while in the face of growing resistance in the paper market. week. This two-month streak with the net speculative position of gold traders rising every week, has just tied the record-longest gains streak achieved – in the history of the COT report (going back to 2006) it has never risen for NINE consecutive weeks. History for COT nerds (like myself) could be made next week if gold speculators continue their torrid streak. This post was published at DollarCollapse on SEPTEMBER 11, 2017. The stock market is zooming this morning on the news that only 5.7 million people in Florida will have to do without air conditioning, hot showers, and Keurig mochachinos at dawn’s early light Monday, Sept 11, 2017. I’m mindful that the news cycle right after a hurricane goes kind of blank for a day or more as dazed and confused citizens venture out to assess the damage. For now, there is very little hard information on the Web waves. Does Key West still exist? Hard to tell. We’ll know more this evening. The one-two punch of Harvey and Irma did afford the folks-in-charge of the nation’s affairs a sly opportunity to get rid of that annoying debt ceiling problem. This is the law that established a limit on how much debt the Federal Reserve could ‘buy’ from the national government. Some of you may be thinking: buy debt? Why would anybody want to buy somebody’s debt? Well, you see, this is securitized debt, i.e. bonds issued by the US Treasury, which pay interest, and so there is the incentive to buy it. Anyway, there used to – back in the days when the real interest rate stayed positive after deducting the percent of running inflation. This is where the situation gets interesting. The debt ceiling law supposedly set limits on how much bonded debt the government could issue (how much it could borrow) so it wouldn’t go hog wild spending money it didn’t have. Which is exactly what happened despite the debt limit because the ‘ceiling’ got raised about a hundred times though the 20th century into the 21st so that the accumulated debt stands around $20 trillion. Apple Inc. had hoped that its iPhone eight might demolish the company’s sales records in China as the country’s burgeoning middle class embraced the phone, thanks in part to its name: Eight is considered a lucky number in Chinese culture, signifying wealth and fortune. Unfortunately for the world’s most valuable company, this calculus isn’t playing out as well as its massive marketing operation had hoped for one simple reason: The price of the phone is simply too high for most members of the company’s target demographic. However, Apple investors reacted positively to news Monday that the company’s iPhone 8 would be priced at $1,000 a unit. AAPL was up nearly 2% in early trade. Two versions of the iPhone 8, along with a third premium model known as the iPhone X, will be officially unveiled at its product launch in Cupertino tomorrow. Details on price points of the new devices and their availability dates are still unknown, though even the cheapest of the latest top-of-the-line model is expected to cost about $1,000. Whenever I tell people the next big crisis will come from inflation, not deflation, the looks of disgust are worse than when someone says Justin Bieber’s music is not that bad. And when I try to tell them that the true bubble is in fixed income, not stocks, they look at me as if I just slipped the Biebs into the next-up slot on the Spotify playlist. ‘Where will the growth come from?’ they often ask or, ‘demographics will keep inflation subdued for another generation,’ they retort. But that has always left a sour taste in the mouths of the deflationistas who cannot imagine anything but falling prices and moribund growth. These investors need a theory why the trend will change. And it has always been difficult to slap any research in front of them as the Lacy Hunt deflation crowd seems to have the market cornered with their articulate forecasts that the trends of the last 30 years will continue ad infimum, and that interest rates are going to zero throughout the entire developed world. This post was published at Mauldin Economics on SEPTEMBER 11, 2017. The Chinese have announced the launch of a gold-backed, yuan-denominated oil futures contract. The move potentially creates a way for oil exporters to circumvent US dollar denominated benchmarks by trading in yuan. The contracts will be priced in yuan, but convertible to gold. An article in the Nikki Asian Review explains the significance of the move. This post was published at Schiffgold on SEPTEMBER 11, 2017. North Korea’s sixth nuclear test and the world’s response Damage assessment and rebuilding following Hurricane Harvey and now Hurricane Irma FOMC meeting and the possible start of its balance sheet reduction (aka. Quantitative Tightening) Raising the debt ceiling (note: this was kicked to December as this article went to press) The normalization of the Treasury’s cash balances Some of these events pose higher risks than others. Some of them are more probable than others. All of them increase market uncertainty and will, therefore, affect price action in one way or another. This post was published at FinancialSense on 09/11/2017.